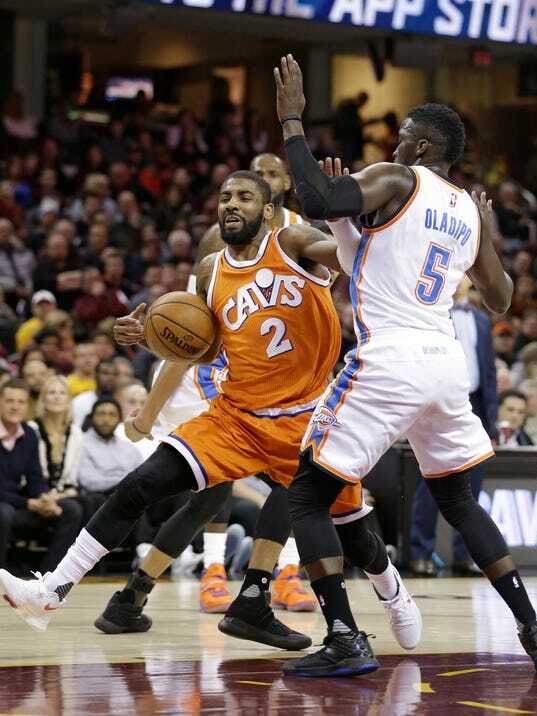 CLEVELAND (AP) — Kyrie Irving scored 29 points, LeBron James had 25 and 14 rebounds and the Cleveland Cavaliers played one of their better all-around games in weeks, beating Russell Westbrook and the Oklahoma City Thunder 107-91 on Sunday. The Cavs have won two straight after the NBA champions lost six of eight amid internal turmoil sparked by James criticizing the team’s roster following a recent loss. But while not forgotten, the chaos has calmed down a bit and a quality win sure helps. Westbrook finished with 20 points, 12 rebounds and 10 assists for his 24th triple-double, but only made 7 of 26 shots for the Thunder, who had won three straight. Cleveland All-Star forward Kevin Love didn’t play in the second half because of back spasms. Love has been dealing with back issues since he came to Cleveland and he missed a game earlier this month with spasms. James became the first player in Cavaliers history to score 20,000 points for the franchise. He came in needing six points to hit the plateau and reached it with a layup early in the second quarter. Oklahoma City played its first game without reserve center Enes Kanter. He broke his right forearm punching a chair Thursday in a win over Dallas, had surgery Friday and will be out at least a month.